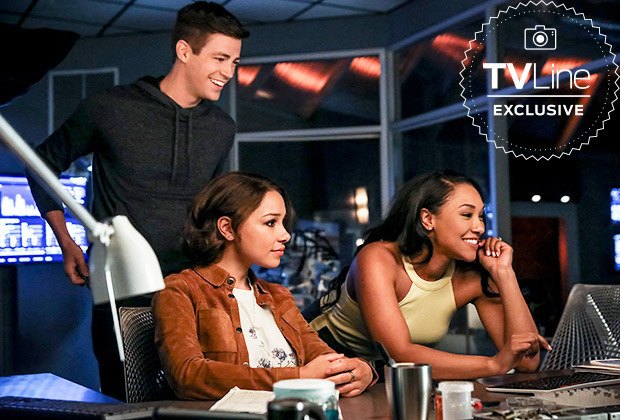 TV Line has a new Flash Season 5 still featuring Grant Gustin (Barry), Candice Patton (Iris), and their new TV daughter Jessica Parker Kennedy (Nora) as well as some quotes from Executive Producer Todd Helbing about the new season which starts October 9 on The CW. Here’s that photo; new spoilers follow. 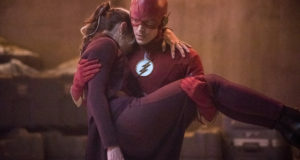 Nora’s presence will start to have a little strain on the Barry & Iris relationship “Iris and Barry become second to Mom and Dad,” Helbing told TV Line. Cisco is having trouble getting over his break-up with Gypsy. 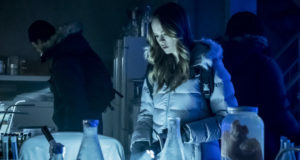 Caitlin searches for her Killer Frost origins. Ralph struggles to earn the respect of the city as a superhero. You can find the TV Line feature here. If you’d like to see FlashTVNews’ interviews with the cast and producers about Season 5, speed on over to YouTube!